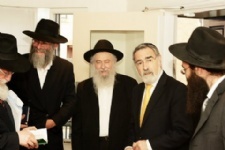 Last Sunday, Chief Rabbi Lord Sacks officially opened Cambridge's first Mikvah. After almost 30 years of planning and discussions, construction began after Pesach and was completed shortly before the inaugaral ceremony. The ceremony took place at the Rohr Chabad Centre where the Mikvah is located. Due to limited capacity at this venue a small number of invitees were in attendance. However, over 120 people gathered at the Shul afterwards for a reception to mark the event and to celebrate this exciting new addition to Cambridge's Jewish community. The events were attended by a number of local representatives and dignitaries including the member of parliament for Cambridge Mr Julian Huppert. During the ceremony Lord Sacks spoke of the centrality of a Mikvah to a Jewish community and commended Rabbi and Rebbetsin Leigh for finally bringing the project to fruition. The community has been discussing plans to install a Mikvah for many years; until now each effort was met with resistance or experienced practical problems which halted its progress. In 2006, Chabad of Cambridge purchased the Rohr Chabad House on Castle Street and from that point onwards Rabbi Reuven Leigh renewed the campaign to install a community Mikvah on the grounds of the new Chabad House. Since then the community has pulled together and united behind this project. The committee responsible for the project felt strongly that it was important to use local contractors for the work. By working with local architects and construction teams it provided an opportunity for Jews and non-Jews to come together helping break down barriers in the community. The project has been made possible thanks to funding secured in advance from a number of community donors. 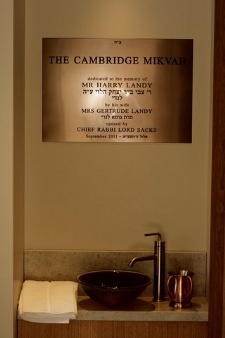 The Mikvah has been dedicated in memory of Mr Harry Landy by his wife Mrs Gertrude Landy. The Mikvah Room was dedicated in memory of Rabbi Leigh's sister-in-law Mrs Rochie Paley through generous donations from her family and friends. After being involved in discussions for many years and overseeing the project from start to finish, Rabbi Leigh has big hopes for the Mikvah. He said, 'Aside from serving the needs of religious women who until now have had to travel to London for the nearest Mikvah, I hope that it will also encourage more Jewish women that have never performed this Mitzvah before to come and use it'.